When it first appeared on the consumer market, the Fitbit Ultra was one of the pioneer fitness gadgets that sparked the creation of a slew of social health gear, such as the Nike+ Fuelband and the now-defunct UP by Jawbone. 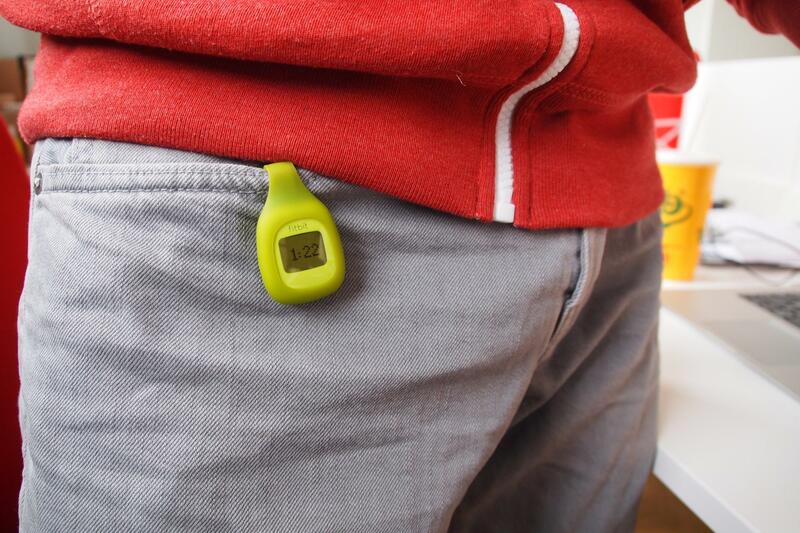 Now, Fitbit’s got a more budget-friendly version of its premier device known as the Zip. It’s smaller, cuter, comes in various colors, all designed to make you more aware of everyday health. Compared to the Ultra, and even the recently announced Fitbit One, the Zip is tiny. The downsizing makes the Zip almost as small as a quarter. And in its silicone, water-resistent case, the device comes out to be about half the length of a business card. The soft case allows you to clip the Zip onto your clothes in case you don’t prefer to throw it into your jeans like you would pocket change. Unlike the more advanced One, the Zip uses an external rechargeable battery, which needs replacement approximately every six months. The screen also has a tap recognition feature that rotates between the items displayed in response to each tap received. For example, waking the Zip up from blank screen will display the last thing you looked on, which could be anything from Steps Taken, Calories Burned, Time, and Miles Traveled. The Zip also rotates with a strange emoticon that rates its satisfaction level of how much you’ve worked out today. When I first booted the Zip up, it stuck its pixelated tongue out at me, but after several hours of wear, the face changed to a grin and a wide smile. Okay, thanks, Zip. 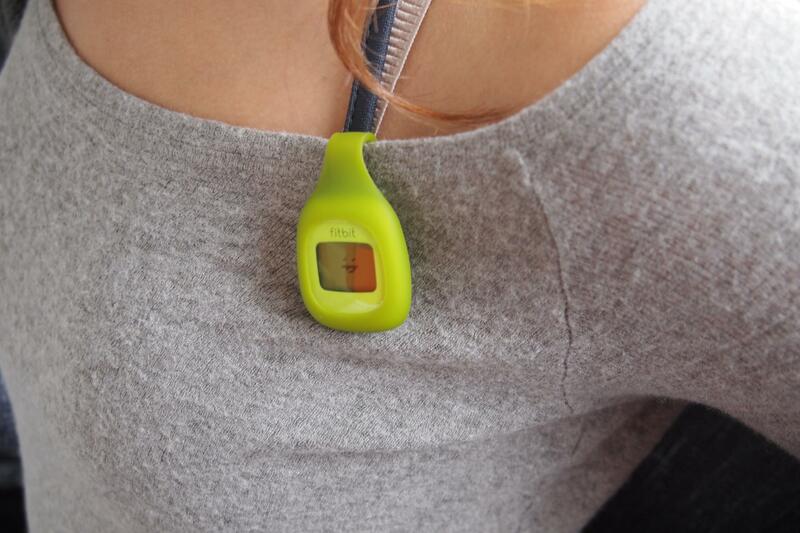 Since the Fitbit Zip is so small, it is barely noticeable when worn. After a while, you forget it’s even there until someone makes a remark at the Tamagotchi-like creature you have pinned to your shirt. It’s a conversation-starter piece for sure, and the selection of bright colors help you coordinate it with your closet. After you clip it onto your outfit, just resume your day as normal. 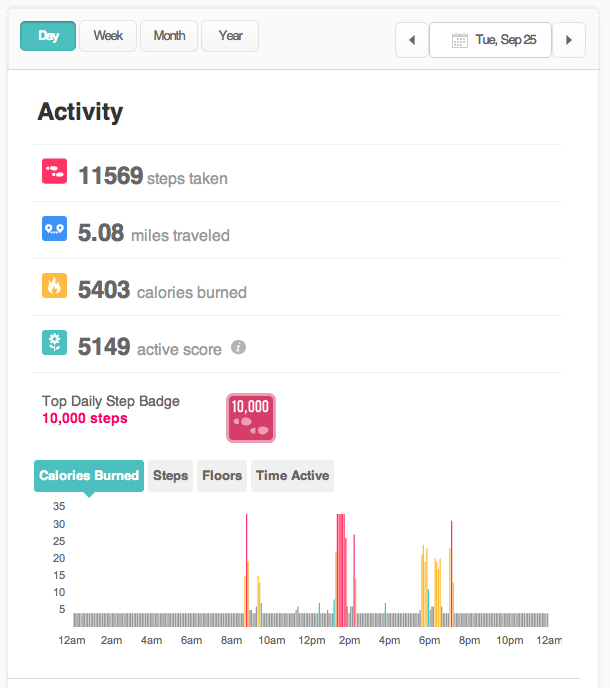 Later, check back with your Fitbit web dashboard to see how your day is going. When you first set up the device, you have to make sure the Zip is in range of the wireless USB dongle that comes with. 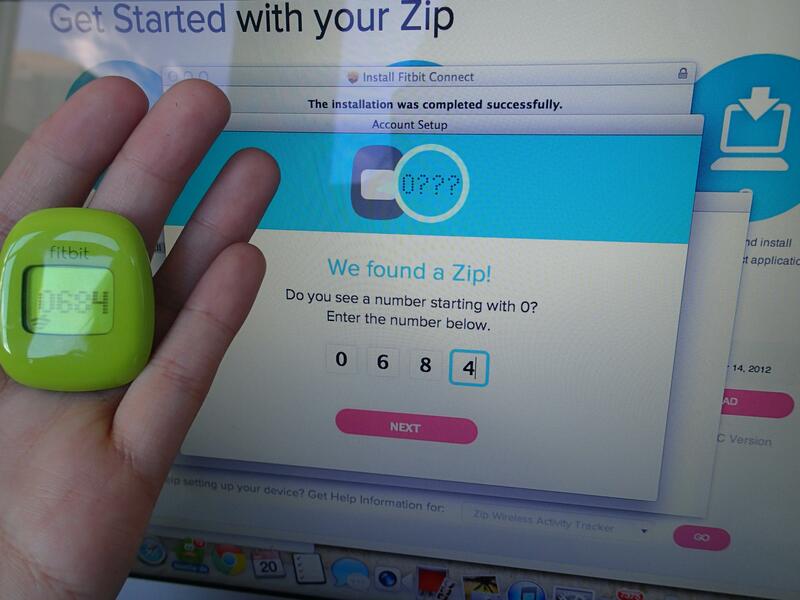 A quick installation process syncs the dongle with the Zip, and all you have to do is enter the number that shows up on your device along with your height, weight, age, and gender. Each time you are within the dongle’s range, the Zip updates your activity information to your online account, and continues to do so every 15 minutes. What’s surprising to me is how accurately the Zip was able to distinguish between walks and my ride on the train to work. Both include fairly physical shakes, but as I watched the Zip like a hawk during my bumpy train ride, the Zip did little to add an accidental step in my total walking count. Once I started walking again, it took a few seconds for the device to register the movement and the numbers sprang back up. The average person burns approximately 2,000 to 3,000 calories per day. An average New Yorker like myself probably burns more, thanks to the endless fast-paced walks we take daily. I’ve been wearing the Fitbit Zip for about a week, and my daily walks plus normal activities (meeting friends for dinner, cleaning, cooking) comes to a low of 7,400 steps on a regular day and 12,400 steps on a busy one. At this rate, I am walking an average of four miles a day — which isn’t too shabby at all. So how can I make the Zip help me get even fitter? The Zip definitely works better used in conjunction with its web interface, which allows you set calorie burning goals. The site automatically sets your goal at 10,000 steps a day, but you can adjust this to suit your fitness level. Each time you reach a goal, you also receive a badge as a reward. This gamified process is cute and encouraging, and seeing all your daily activities in a graph helps you feel more motivated to keep things up. If you own the Fitbit Aria scale, the two gadgets are also clearly meant to complement each other to keep your activity level high and your weight low — or at least on track. 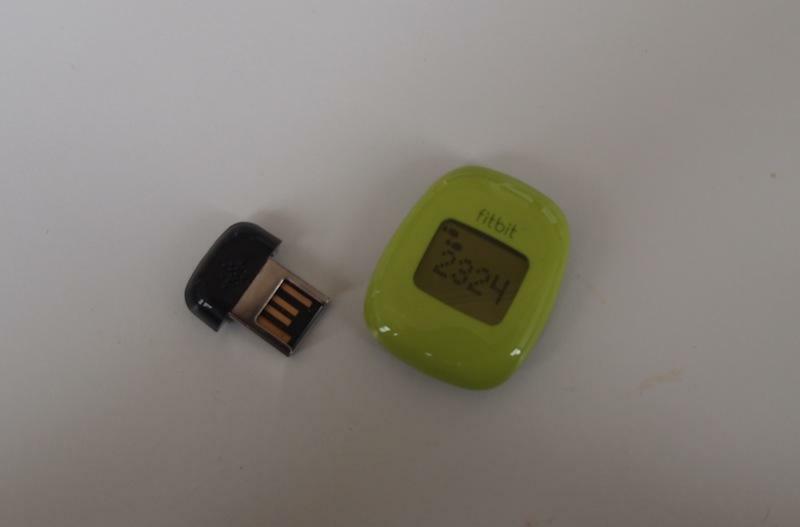 There are a few issues with the Fitbit Zip compared to other wearable fitness gadgets. For example, the device relies heavily on being clipped on your clothes or carried around. What abut the calories you burn in the shower, or other, ahem, activities where you’re not required to wear clothes? A gadget like the Nike+ Fuelband would be able to give you an estimate since it’s worn as a wristband, but the Zip is best for walkers and runners. The Zip also doesn’t have backlighting, so no viewing your stats after dark. Of course, at just $60, you have to accept the Zip’s lack of features and realize that’s what you get for skimping out an extra $90. The Fitbit Zip is a great introductory gear for those who want to exercise more with minimal effort. When you wear a fitness gadget, your subconscious just becomes infinitely more aware of your daily activities. You want to please the tongue-sticking face on that little device, and if that means taking 2,000 more steps in a day, you’ll do it. I do believe the science is purely in your head, and a constant reminder that sits in your pocket is a nice way to start. The Zip is designed to keep you motivated to move, and will make a neat gadget to treat yourself with, or as a gift for those looking to have more fun with fitness.